Norfolk van artist Ruddy Muddy didn't take long to react to news of today's royal engagement. He's already revealed his latest "mudsterpiece" on the back on his white van in Wicklewood, near Norwich, congratulating Prince Harry and Meghan Markle. Ruddy Muddy, whose real name is Rick Minns, tweeted the royal family with an image of his artwork. Prince Harry showed off his football skills when he joined Norfolk villagers for a Christmas Eve football match. Harry is spending part of the festive period with other members of the Royal Family who are enjoying a traditional break at the Queen's private Norfolk estate of Sandringham. He played in the same fixture last year for the Sandringham estate workers who took on villagers from neighbouring Castle Rising. Harry was a key member of the team, making tackles and getting involved in the action. Harry's team ran out easy winners. 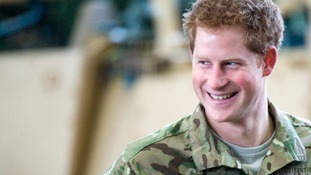 Prince Harry will visit an RAF base in Suffolk today where he will meet servicemen and women and their families. Harry, who spent Remembrance Sunday in Kandahar in honour of the fallen, will present No 26 squadron RAF Regiment with a new standard during a parade at Royal Air Force Honington near Bury St Edmunds. He will then watch the regiment parade before visiting the station's new heritage centre and meeting service personnel and their families. A standard, a historic ceremonial flag, is presented to RAF Regiment squadrons every 25 years and represents hundreds of years of history of service to the monarch and to the country. Royal Air Force Honington is the RAF's centre of Force Protection and is the depot of the Royal Air Force Regiment - the ground fighting force of the RAF. The regiment protects air bases from attack and is trained in a wide range of RAF protection roles. The Queen appointed her grandson Honorary Air Commandant of RAF Honington in October 2008. Harry last visited the base in February 2012, when he presented a selection of service commendations to RAF personnel and crews who were serving in Afghanistan. In July 2010 he also visited the base to present the families of two servicemen killed in Afghanistan with the Elizabeth Cross. Prince Harry, a former Wattisham based Apache pilot, has praised the people of Suffolk during a visit to the county. There he spoke fondly of the county where he was based for more than three years. 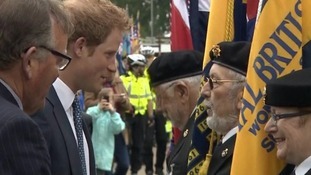 Prince Harry has praised the people of Suffolk for putting up with his day and night Apache helicopter flights. Prince Harry has been playing football and rugby with youngsters at Inspire Suffolk. He faced penalties and also joined a game of touch rugby. Prince Harry has been saving penalties during a football training session with youngsters in Suffolk. He's been visiting Inspire Suffolk and arrived in a polo shirt and trainers ready to join in the action. He clearly enjoyed playing both football and rugby with the youngsters. Prince Harry also happily posed with the youngsters for a team photograph afterwards. Prince Harry has taken to the training field to play rugby and football with youngsters at Inspire Suffolk.